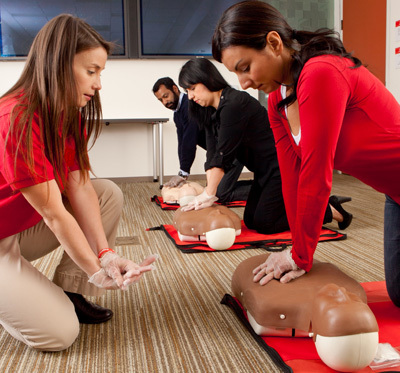 CPR Training Professionals is an industry leader in onsite group CPR and First Aid certification. Since 1998 we have been providing CPR and First Aid certification to organizations and businesses throughout San Bernardino County. We provide onsite certification to the following San Bernardino County cities and areas: Chino, Chino Hills, Colton, Fontana, Grand Terrace, Highland, Loma Linda, Montclair, Ontario, Rancho Cucamonga, Redlands, Rialto, San Bernardino, Upland, Yucaipa. Whether your workplace needs to meet OSHA guidelines for First Aid; your a Healthcare provider who needs Basic Life Support; or your a group of parents who want to get your CPR certification – we have the training and certification programs to meet your groups needs. Ideal course for Emergency responders, housekeeping and janitorial staff, health care providers, law enforcement, and anyone with potential for exposure to blood or body fluids. This optional add-on course meets OSHA’s revised Bloodborne Pathogens Standard. This course teaches participants how bloodborne pathogens are spread, how to prevent exposures and what to do if exposed to infectious materials. What San Bernardino County areas do we serve? We provide onsite training throughout San Bernardino County including Chino, Chino Hills, Colton, Fontana, Grand Terrace, Highland, Loma Linda, Montclair, Ontario, Rancho Cucamonga, Redlands, Rialto, San Bernardino, Upland, Yucaipa. Do we provide onsite training to other cities/areas not listed? Yes, we will provide group training up to 2 hours or 120 miles away from our Orange County Training Center. *Additional travel fees apply. Do we offer classes for individuals open to the public? Yes, in addition to on-site group training we also offer classes open to the public at our Training Center in Orange. Where do we train? We train at our clients location; office, workplace, school, home, etc. or we train at our Training Center located in Orange. Do we offer on-site training to groups smaller than 10 people? Yes, we train groups of any size but the class minimum would apply. What kind of training do we use? EMS Safety programs, American Hearth Association and American Red Cross programs. Class fees displayed are for EMS Safety certification, American Red Cross certification is available for $10 additional per person. Class Deposit: A class deposit of $100 is required at time of reservation. The class deposit is non-refundable and will be applied to the balance due on the final invoice. Payment: Unless prior arrangements have been made, final payment is due at the time service is rendered. We accept business checks (no personal checks) and credit cards: Visa, MasterCard, Discover and Amex. Payment by credit card must be made prior to the class date by completing the credit card authorization form below. Rescheduling Policy: Classes rescheduled prior to 48 hours of the scheduled class date may be rescheduled free of charge by calling 714-602-9796. For classes rescheduled with less than 48 hours notice a fee of $50 is due at the time of the reschedule. Cancellation Policy: There is a $100 cancellation fee for all canceled classes. Participant Count: A final participant count is due at least 48 hours prior to the scheduled class date so that we can adjust the invoice accordingly. If less than 48 hours prior to the class date, a $15 drop fee will be charged per person. If a participant is a no-show at the time of the class, the full invoiced amount is due. Ready to Book a Group Class?